Working with heavy topology and large projects with too much geometry can slow down your viewport, which at times might be quite irritating, especially when you have too much geometry and have to fix minor issues. This can be avoided by enabling VBO (_V_ertex _B_uffer _O_bject) which is a nice feature in Blender. To make things simple VBO is a simple process in OpenGL that uploads vertex data (position, normal vector, color, etc.) to the graphics card instead of the system memory. This can have a big impact on performance by reducing lag, it can also let your hardware handle more geometry, because of a dedicated piece of hardware optimized for handling such tasks. Modern graphics cards are designed for handling the intense load (rendering, baking, etc). However, it is not recommended to have VBO enabled if you are using old graphics cards that have outdated drivers or those that are not supported by the vendor. 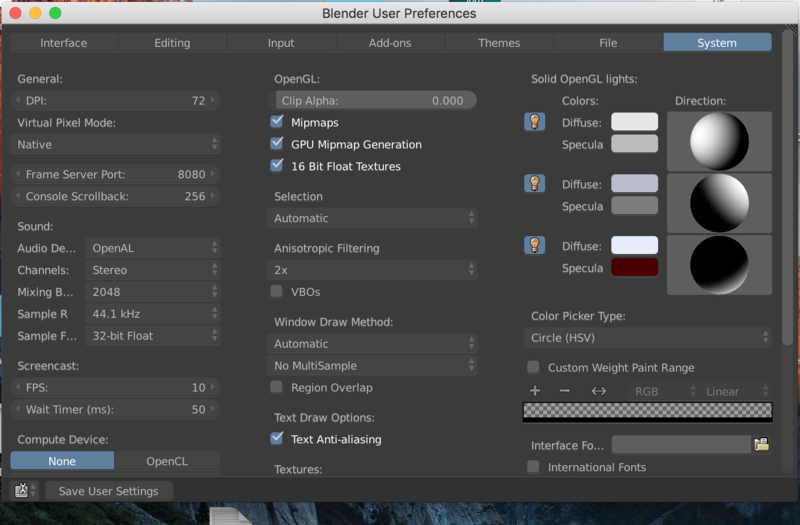 In Blender release 2.77 this feature is enabled by default and cannot be disabled (the option has been removed). Here is a video to show how this helps. Head over to the System tab. Tick the VBOs box, this will enable VBO.